The OOSA Club Database is a really straightforward and affordable database product designed to simplify the administrative process of recording bookings, creating daily registers, and generating invoices. Developed by the childminding software experts CM Software, The OOSA Club Database is available exclusively to OOSA members at a one-off price from £227 (for the basic version) to £357 (for the enhanced version). There is no monthly fee or annual subscription and no hidden set-up charges. iPAL is the UK’s most advanced booking, payment and management software system for out of school clubs. Offering you a range of easy-to-use tools, iPal allows you to simply create your own bespoke system that supports all your business needs. iPAL prides itself in being a market leader, offering management flexibility to settings across the UK. OOSA members benefit from a 20% discount on the annual subscription to iPAL, which includes full support and training, and a dedicated account manager. Sage Business Cloud Accounting takes the pain out of everyday financial and accounting tasks. The simple, jargon-free software requires no accounting experience or training, and will help you keep track of the money going in and out of your business. OOSA members get the first 30 days of their Sage Business Cloud Accounting or Payroll Service FREE, plus the next three months at 50% off. This means that you can try out your chosen Sage service for four months before you have to start paying full price - and you can cancel your subscription at any time. 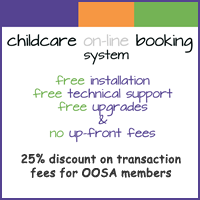 The Childcare on-line Booking (CoB) system is a unique after school and holiday club booking system designed for the needs of wrap-around childcare providers; it has no set-up or licence fees and comes with free technical support, upgrades and enhancements. Instead CoB shares the risk with you and charges a small percentage (2.5%) of each booking. CoB is a cloud-based solution - so there are no installation or hardware costs - and works for parents and childcare providers alike. It is configurable for most requirements and the developers are constantly updating the system to ensure it provides all the functionality you need at your fingertips. PLAYtarium (an OOSA member) said: "Less administration time - increased cash-flow - happier customers!" OOSA members benefit from a 25% discount . 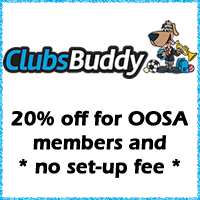 ClubsBuddy is an affordable, user friendly tool to help you manage your out of school club. ClubsBuddy and its sister product (SchoolsBuddy) are trusted in hundreds of clubs and schools worldwide. ClubsBuddy allows you to create customisable online registration forms to collect child and parent data, publish available dates to parents so that they can book and pay online, reconcile cash and childcare voucher payments, take registers, generate reports, and much more. OOSA members enjoy a 20% discount on the annual subscription to ClubsBuddy, and no set-up fee. Click here for your exclusive OOSA discount code. magicbooking is a cloud-based childcare management system which streamlines and automates your day-to-day admin tasks, enables parents to book and pay online from the comfort of their home or on the go from their phone, takes payments for you or chases up unpaid invoices! There is no software to purchase, no upgrades or backups to worry about, it is available from anywhere and gives you access to all the information you need from one single place. OOSA members enjoy a 20% discount on the monthly subscription to magicbooking. If you're spending too long on your club's administration, chasing payments and juggling registers, Kids Club HQ is for you. Its cloud-based system is saving clubs like yours loads of time each week. Parents can book online with a simple booking process capturing all the information you need (sessions required, emergency contacts, dietary requirements, GP details, etc). For parents with regular bookings, invoices are automatically generated on a schedule to suit your club. Managing bookings, customer information and viewing up to date registers is a doddle with the powerful Kids Club HQ administration system. OOSA members benefit from a 20% discount off the monthly fee.